Click to download a PDF of the Waimea Nui project map. The Waimea Nui Community Development Corporation (Waimea Nui CDC) is the native Hawaiian organization undertaking the projects which form the centerpiece of the Waimea Nui Regional Community Development Initiative (Waimea Nui RCDI). This initiative is a result of a community-based effort by the Waimea Hawaiian Homesteaders’ Association, a native Hawaiian controlled and owned entity, which utilized beneficiary-driven community plans dating back to the early 1960’s as its foundation. The Waimea Nui RCDI helps fulfill the purpose of the Hawaiian Homes Commission Act by supporting self-sufficiency and self-determination for native Hawaiians, as well as preserving native Hawaiian values, traditions and culture for generations. 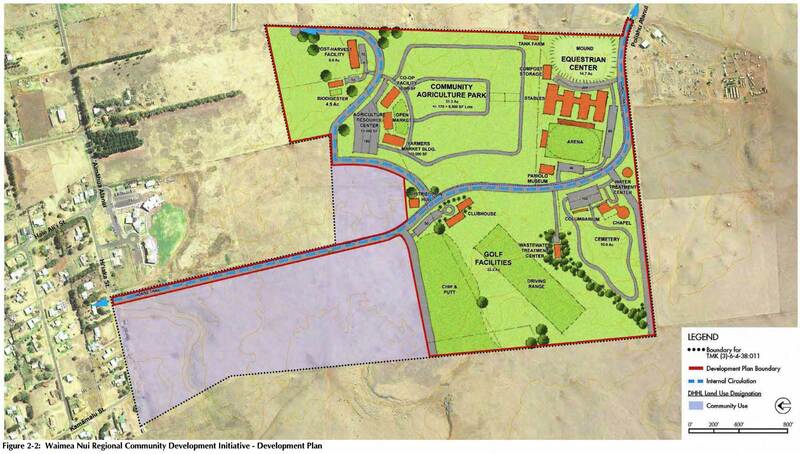 The project will enable the Homestead community to meet targeted goals of economic self-sufficiency through a dedicated program centered on the community lifestyle of Waimea, including an agricultural park, equestrian and recreational activities, including a full-service golf facility, while also providing a homestead cemetery for families in the region. The Waimea Nui RCDI is an excellent example of native Hawaiian beneficiary organizations working in collaboration with the Department of Hawaiian Home Lands and other Federal and State agencies to bring their community’s collective vision to reality.